Wild Gunman is a video game by Nintendo released in 1984 for the Famicom and on the Nintendo Entertainment System (NES) in 1985. It is a light gun game based upon an arcade game of the same name that played a full motion video of a gunslinger that you had to shoot. The console version has replaced the full motion video bad guys with 8 bit cartoon characters. The game has 3 different modes to play. The first mode has you going up against one bad guy. The second mode has you against two enemies. The last mode takes place in front of a saloon with a door and numerous boarded up windows. The windows and doors open at random with a bad guy that tries to kill you if you aren't fast enough on the draw. The showdown rounds have one or two bad guys walk to the center of the screen and then face you. When he says fire you need to fire under the time it takes him to shoot you. If you're fast enough you will the showdown and if you don't you die. The trick of the game is to fire when the bad guy blinks. "I'm a crack shot at this." As far as I can tell there is no end to the game, it's and old school points game. As you kill guys the next challenger is harder than the last which gets you more points if you can kill him but eventually they will be too fast to kill ending your game. As this is a light gun game you can't play this on a modern TV, you'll need an old CRT TV. Unless I'm mistaken, and I could very well be, you won't be able to play the game through emulation either. The only way to play it will be the old school way, the way you were meant to. As far as the game goes it's OK for a few minutes of fun with your friends but it gets pretty old quick. As I said there are three modes which help to give a bit of variety. In 2015 would I recommend this game? Unless you are collecting I would have to say no. It's one of the better light gun games so if you like plaything those kind of games you may like this game but since most people probably can't even play on their TVs it kind of settles that question. 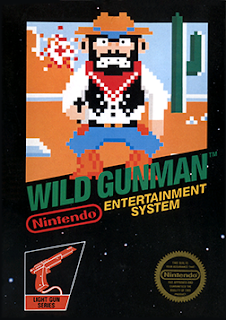 I give Wild Gunman a 4 out of 10. "You mean you have to use your hands? That's like a babies toy."